Butyric acid is an organic acid which chemical formula is CH3CH2CH2COOH. It's used for aromas and esters production, having for most of them pleasant tastes. Therefore, they are used as additives in perfums and feed industry. 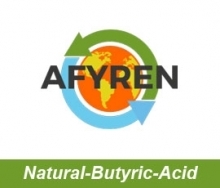 AFYREN produce a 100% biobased Natural Butyric Acid with a respectful process for environment and non GMO natural microorganisms. The raw materiels used are also non GMO.